Buy that wheelbuilder a drink! The tire doesnâ€™t look flat to me. Not even on the bottom. don't know how the tube and tire will act when flat. Looks more like an uneven road section in this picture. Try looking at the original Daily Mail photo. pushing the rim a bit to starboard. The tire doesn’t look flat to me. Not even on the bottom. bother counting how many non-unique versions were out there. think the server might be down. 1. I've never ridden a fixie. It was tineye, but after quickly giving up because the "larger versions"
different from the rest of the bike. road works for interfering with our investigation. in the bumper cover to not lift the front to the car off the ground. is mangled and the spokes are broken. I'll agree that it is difficult to discern but you can't REALLY believe that that much damage was done to that car and the wheel is unharmed? Photoshop work on the best photos and send the photo to the media. how it was done. Yes, it can be faked, but why bother? There's no skid mark on the pavement behind the rear tire. bad touchup job to hide an inconveniently placed shadow. Jeff - I want you to think of this - that's an Illinois license plate. If that actually occurred why would it not be all over national news? 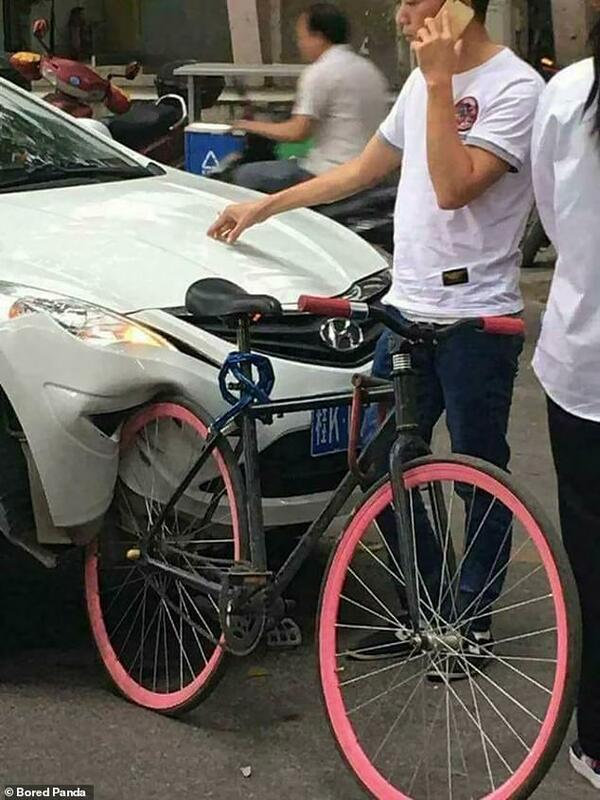 It wouldn't be very difficult to fake simply by the car running into something like a fire hydrant and the cyclist getting a flat from the glass on the road and doing that while someone else took the picture as a joke. I think the photo is fake. The impact would have forced the bike forward. I would have checked it with Snopes but they have banned me for proving that they are politically motivated on a high percentage of their "fact checks".